Up until a few months ago, Mark and I were on very different sleep schedules. Since I spend my days in an office, I have to be up by 7:30 to get ready for work and in bed by midnight. But as an actor, Mark’s schedule varies from day to day. Unless he had an early call time or a cross-town audition, he didn’t have any reason to get up before 10 a.m. or in bed before 1. When it came time to get in bed, I’d crawl under the covers alone and Mark would usually spend a couple hours in the living room, memorizing lines or catching up on his favorite TV show. Even though we lived in the same house, saying goodnight was hard! It sounds silly, but it felt just as agonizing as parting ways did back when we were teenagers heading home to our respective bedrooms. We could spend a perfectly lovely evening together, but saying goodnight would always put a slight damper on the end of the night for me. Mark didn’t love the feeling of sleeping in and staying up so later either, but I don’t think he knew how to break the cycle. So sometime late last year, Mark and I resolved to start getting up and going to bed at the same time. It was a little more of an adjustment on his end, but it only took him a week or so to get used to it. Now we both get up at 6:30 a.m., and go on a little stroll together around the Silver Lake Reservoir. Mornings have never been easy for me, but we both really look forward to this extra hour together. When we get back to the house, I’ll hop in the shower and Mark usually offers to make me breakfast. (That man’s dippy eggs are the best in the West!) We get to spend some more time together while I primp and preen, and when I leave for work, he gets a jumpstart on memorizing those lines or watches the Clippers game from the night before. When we turn in for the night (at 11 p.m. now), we’re side by side for a little pre-sleep cuddle action. It’s an easy change, but it’s had a really positive effect on our relationship and our moods in general. I no longer dread my alarm clock, and we help each other make sure that we’re getting enough sleep and making the most of the daylight. If you’re not already going to bed and waking up together, I’d really recommend it to every couple! It’s hard when you’re busy and have to be at your jobs at different times, but it’s well worth the effort if you can make it work. Do you and your significant other go to bed together? This entry was posted in Relationship Question, Weddings + Relationships and tagged bed, couples, married, question, relationships, sleep. Bookmark the permalink. 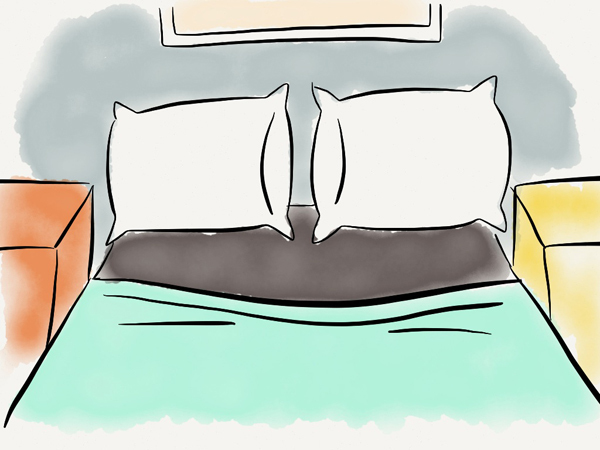 One Response to Relationship Question: Do You Go to Bed Together? I love this post! My bf and I usually go to bed at the same time but I LOVE the idea of waking up early and getting a nice walk in – we’re both usually so rushed in the mornings that we barely acknowledge each other haha. Definitely sharing!